I recently attended the Marketing Partner Forum in Scottsdale, Arizona. I've attended and spoken at this event multiple times in the past, though I hadn't been in a couple years. I was pleasantly surprised to see full rooms, which is a positive sign for the economy. After all, when law firm profits are down, attendance at conferences plummets -- even at those conferences showcasing techniques to increase law firm profits! There are several good recaps of the conference content: here and here and here and here and here and here. You can even see a video recap of one of my sessions here. You can also view the entire Twitter feed from the conference here (note that the most recent posts are displayed first). Although the economy is reviving, General Counsel are not content to go back to the "old ways." They will continue to exert downward price pressure on law firms, seek alternative methods of accomplishing routine legal work and cast a wider net for law firm providers that "get it." Sales is no longer a dirty word in many law firms. 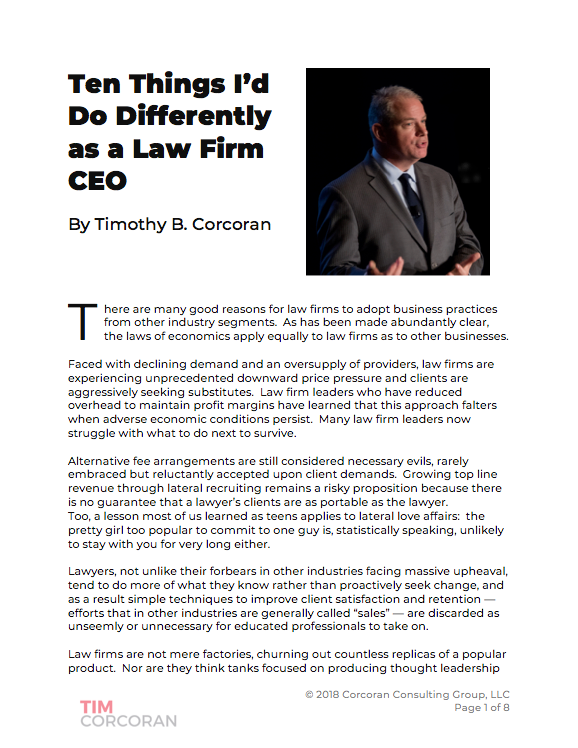 It's no longer sufficient to characterize a law practice as a profession that rises above such mundane tasks as generating business, as evidenced by the numerous lawyers who've had a rough go of it the last few years. If you don't know how to generate new business individually or collectively, you won't thrive. Lawyers are embracing business development more than ever -- and without exploring the nuances too deeply, let's just say that Marketing can be delegated, but Business Development is the lawyers' responsibility. Law firm marketers are employing more sophisticated tools to identify target markets so the firm can more efficiently direct its resources. There is a blurring of the lines between the traditional roles of Marketing, Business Development, Knowledge Management, Finance and Operations. Slowly but surely law firm leaders are realizing that profits can be generated by allocating resources efficiently, and this means not chasing every dollar, not endorsing every partner's whim, targeting prospects that fit the firm's skill set, retaining clients that are profitable, exploring new ways to deliver legal services at lower rates, and so on. There is a clear role for both business process improvement and Legal Project Management, some of which is simply doing things differently, some of which requires technology to be effective. There are a number of firms effectively embracing these concepts, and they are taking work away from competitors one and two tiers above them because they can demonstrate high quality and competency at lower rates, not just talk about it.